Each day thinking of what to make is a big piece of work that strikes every cooks mind.If it is the same type of menu then it becomes always boring. For a morning tiffin or evening dinner if you need a different yet simple side dish for idli or dosa then this instant sambar recipe will be more apt.It needs no coconut or any other fussy ingredients. I learnt this recipe from my mil and used to wonder how she carries even a simple recipe to an exceptional level. In our mil’s village they use to add besan flour instead of roasted gram flour.I love my mil’s recipe very much.While adding besan you have to roast the flour before adding it to the gravy otherwise the raw small of the besan will surely be over powering. 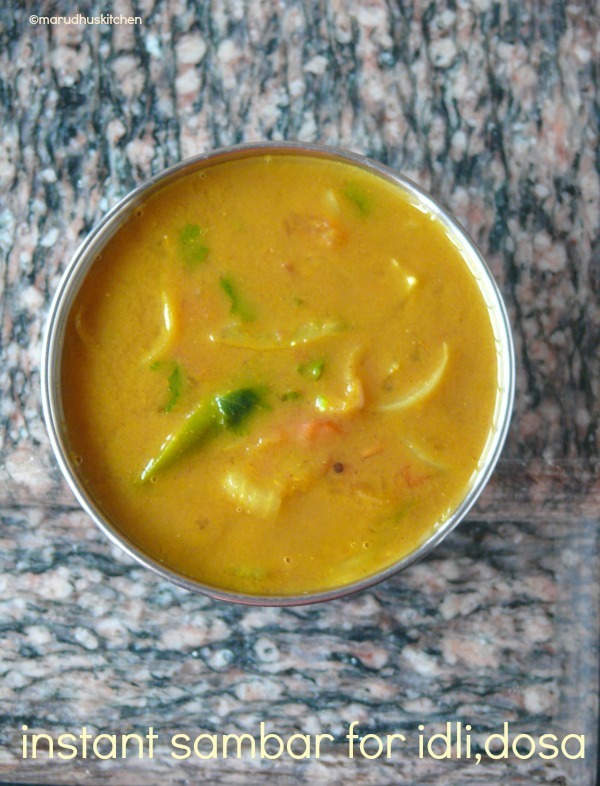 This instant sambar recipe without any dal goes well with idli,dosa or even paniyaram. Sure this tiffin sambar will never disappoint when you feel tired and exhausted. 1.First keep powdered gram dal powder ready. 2.Keep a kadai with oil add mustard to splutter. 3.Add urad dal and bengal gram dal to brown. 4.Add onions to be translucent with curry leaves and green chillies. 5.Then add tomatoes to become mushy. 6.Inbetween in a vessel add gram dal powder, garam masala,chilli powder,needed salt,turmeric powder. 7.Add needed water for the gravy,stir and keep without any lumps. 8.Add this slurry to the onion-tomato mixture. 9.Check for salt and if needed add it. 10.Let it boil and become a medium thin sambar. 11.Switch off after all the rawness goes off,add chopped coriander and serve with idli,dosa or paniyaram. First keep powdered gram dal powder ready. Add urad dal and bengal gram dal to brown. Add onions to be translucent with curry leaves and green chillies. Then add tomatoes to become mushy. Inbetween in a vessel add gram dal powder,garam masala,chilli powder,needed salt,turmeric powder. Add needed water for the gravy,stir and keep without any lumps. Add this slurry to the onion-tomato mixture. Check for salt and if needed add it. Let it boil and become a medium thin sambar. Switch off after all the rawness goes off,add chopped coriander and serve with idli,dosa or paniyaram. 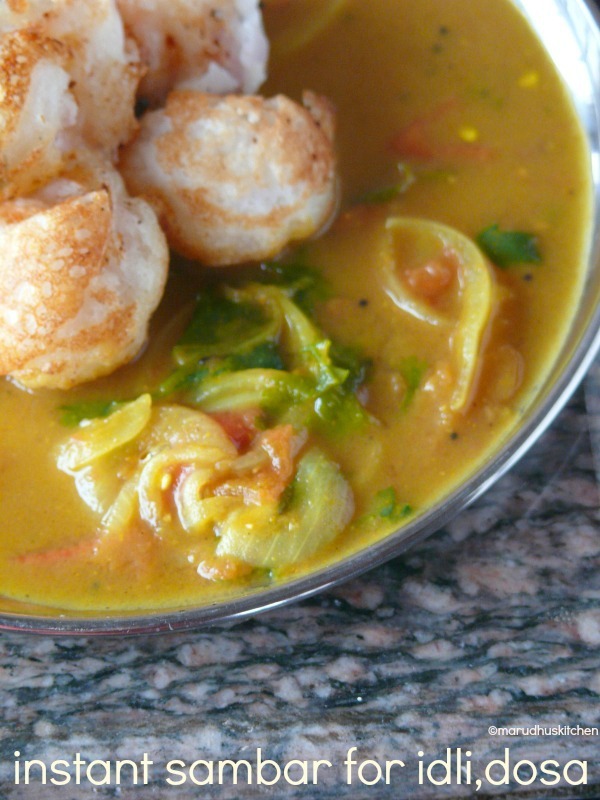 Use tangy tomatoes for balance of taste for this particular sambar. We are using both chilli powder and green chillies so, use with caution. Only roasted gram will be apt for this sambar and if you use besan/chickpea flour it will give different flavour. all time comfort sambar! love your version!